Honey can heal small wounds and burns, prevent infection and reduce scarring in some cases. Here are some suggestions for using honey to help heal skin wounds. Clean the wound. Use mild soap and water, hydrogen peroxide or any kind of cleansing solution recommended by your doctor or pharmacist that won't irritate the wounded area. If the wound has a scab, wash gently and don't try to remove the scab. Pat dry with sterile gauze. Apply honey, using about an ounce per 4 square inches of wounded skin. It may be easier to apply the honey to a dressing instead of the wound, but that is not necessary. Honey can be made more fluid with slight warming. Do not make the honey hot. To warm honey just enough to bring it to a syrup consistency, stir it vigorously or set the container in warm water. Use a cotton swab, clean fingertips or other sterile instrument to apply honey directly to a wound, covering the area evenly. 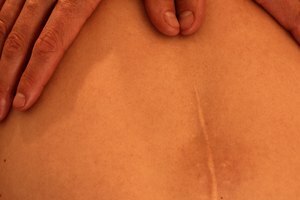 The honey can be applied to wound cavities, as well. Try not to touch the wounded area with the implement. Just let the honey drip onto the skin and cover the area. Cover with a clean gauze dressing or an adhesive bandage for smaller areas. If you are adding honey to the gauze first, saturate the area that will come in contact with the wound. Change dressing at least once a day. 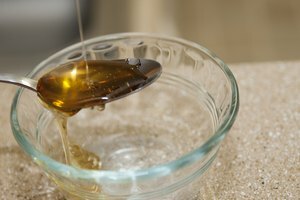 The antibacterial action of honey will prevent wound infection, so frequent dressing changes are usually not needed, unless the wound is "weeping" and the honey is becoming diluted. Before applying a new dressing, bathe or repeat the wound cleansing process. Honey never goes bad or develops mold. Bacteria cannot grow in honey since it is slightly acidic. To liquefy crystallized honey, hold the container under warm running water or let sit in a pan of water until you see it turn back to liquid.